A presentation of: Sacher – The Cookbook – The Finest of Austrian Cooking. Yesterday, the 30th of September was a very exciting day for myself and other food bloggers from every corner of Austria. ‘Why?’ I hear you ask. Well because it was the release of the new Sacher Cookbook and it was presented to us by none other than the Sacher-Chef himself – Chef Werner Pichlmaier. Where else but the magnificent and luxurious Hotel Sacher in Vienna of course. The night before I was so excited I hardly managed to get any sleep. This was my first time attending a book presentation by a highly respected chef in one of the leading hotels in the world. I felt like I was a contestant on the TV show Master Chef. You know when the contestants pass the first round and in the second round they get to cook with a Master Chef at a Michelin star restaurant. Anyway if you know the show then that is how I felt walking up to the Hotel Sacher yesterday. What also made it more exciting for me was that it was also my first blog meeting. 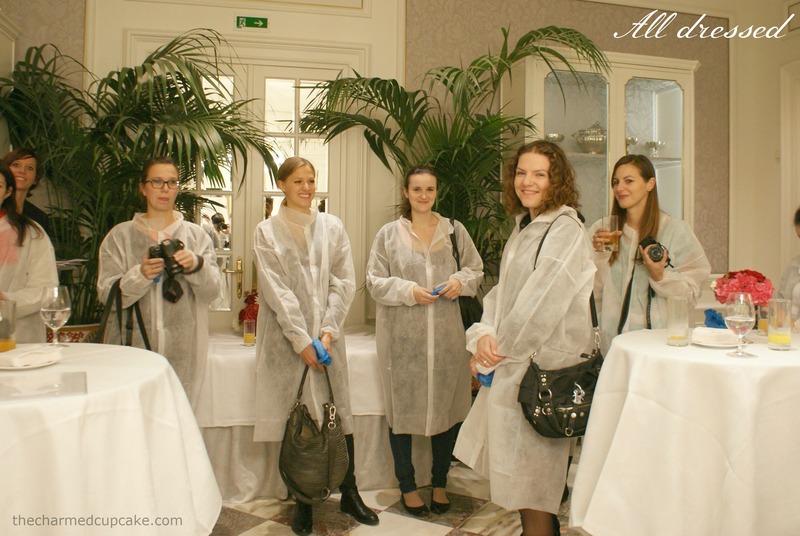 I finally got to meet some very lovely, beautiful and talented bloggers from around Austria. The ones who live in Vienna already knew each other but it was lovely for me to finally put faces to blog names that I have been following. 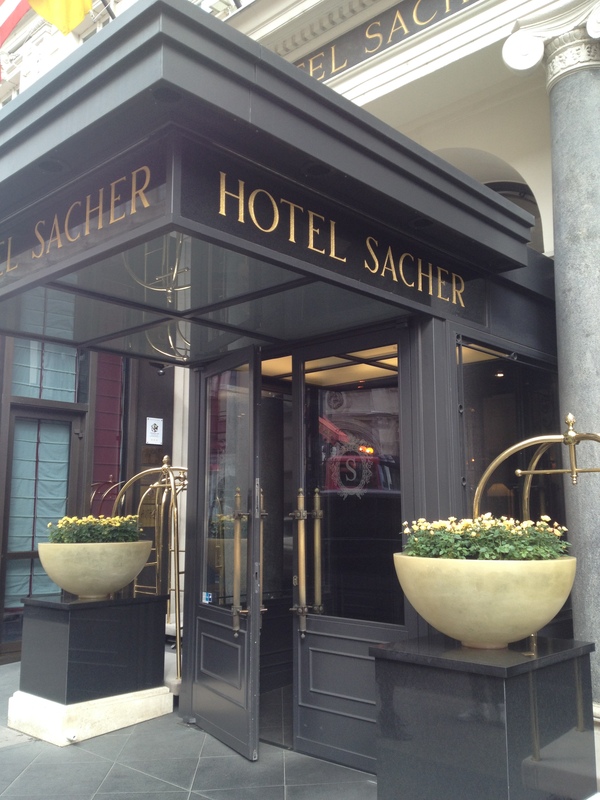 Once we had all arrived and tried to put faces to blogs, we received a very warm welcome by the Hotel Sacher team. From the invitation I had expected a lengthy presentation about the book and then a quick insight into the kitchen where Chef Pichlmaier conjures up his delicious master dishes, but it was quite the contrary. The book was presented to us very briefly and then to our lovely surprise we were all handed food hygiene coats, plastic overshoes and paper chef hats. 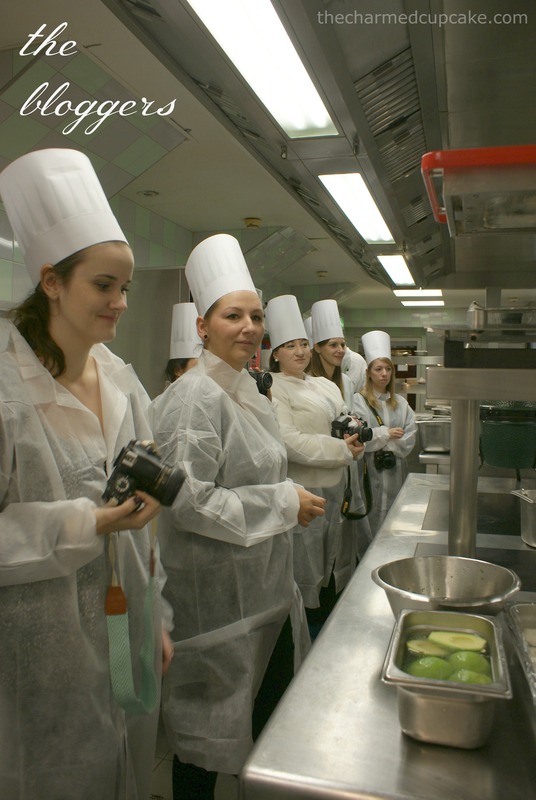 OK we weren’t overly happy about the hygiene coats, shoes and hats – definitely not a fashion statement by all means but I think I could safely say that we were all happy because most of the time would be spent in the kitchen watching the master chef in action. Why did I think we would be sitting for a couple of hours going through the book? 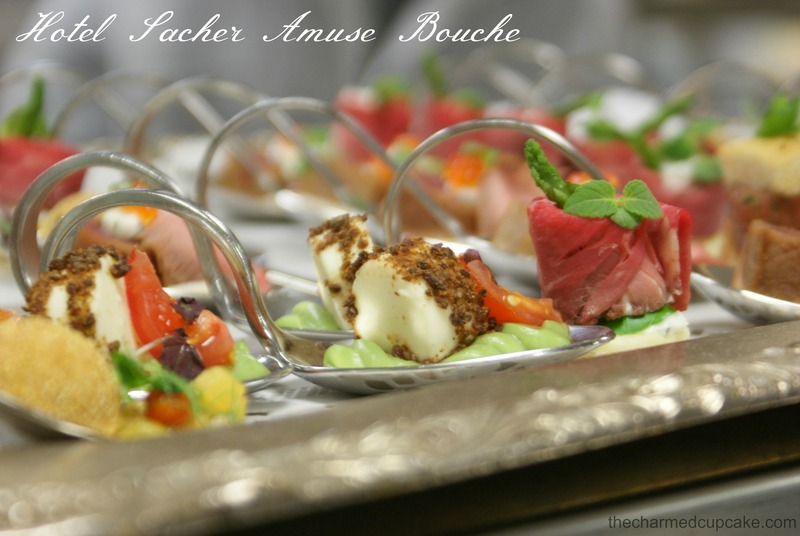 What better way to present the Sacher Kochbuch then by getting us food bloggers involved. I mean, we all cook and/or bake so we knew our way around the kitchen and we most definitely love to indulge our taste buds with gourmet food. As you can see us bloggers have our cameras ready to capture the Chef in action. 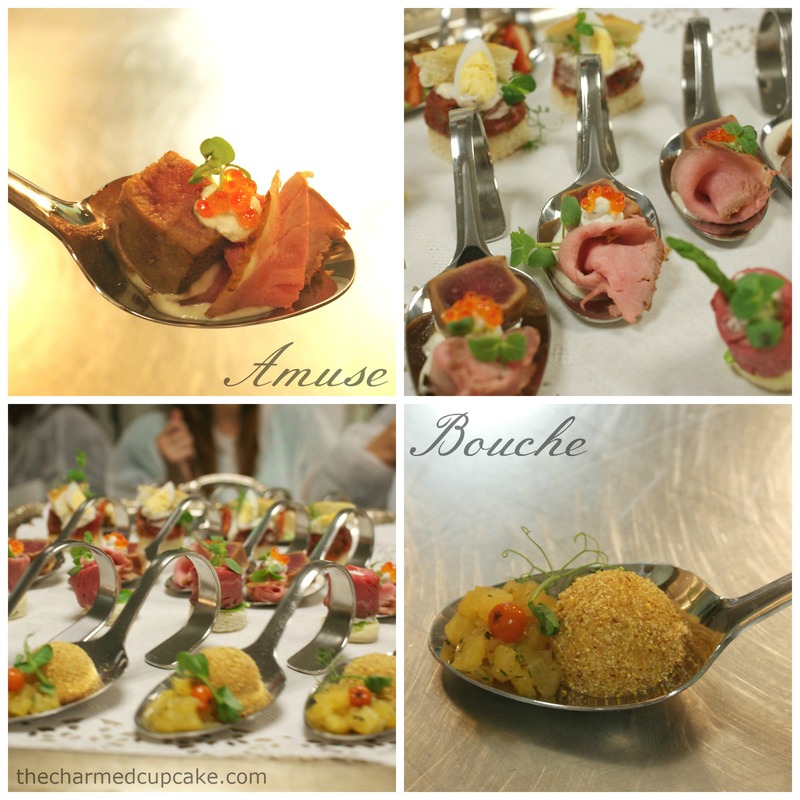 Chef Pichlmaier first started us off with a selection of delicious Amuse-Bouche ranging from seared tuna, roast beef, tuna tartar to goose liver. 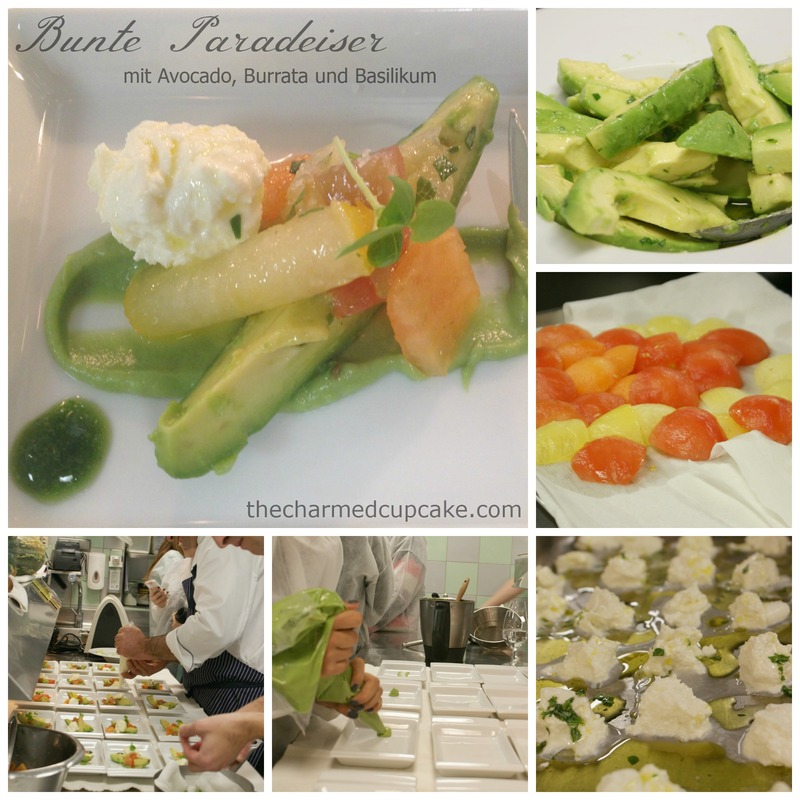 He then put a few of us to work to create the dish ‘Bunte Paradeiser mit Avocado, Burrata und Basilikum’ which in English translates to a tricolour tomato salad with avocado, burrata and basil (recipe on page 61). Whilst the burrata cheese were being marinated with olive oil, the avocados were peeled and sliced then tossed in white balsamic vinegar with finely chopped basil. The three different coloured tomatoes were blanched, skinned, cored and de-seeded and at the same time an avocado puree was made using a thermo mixer. The basil gel and burrata cream were prepared earlier. With so many hands on board the assembly of the dish went relatively quick and before you knew it we were savoring the taste of this fresh delicious salad washed down with a chilled glass of prosecco. 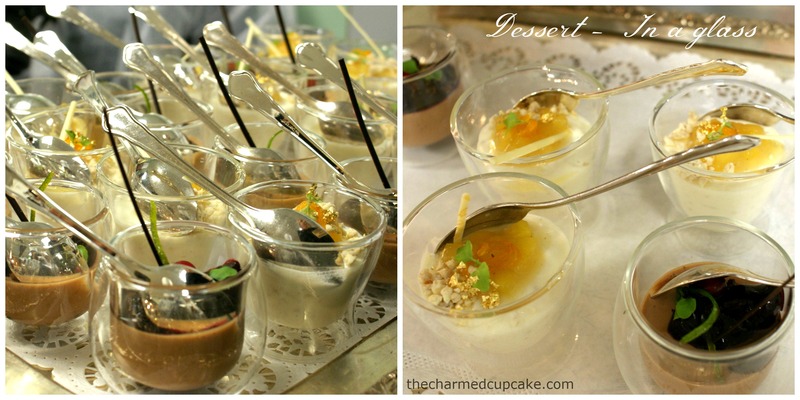 Unfortunately there was not enough time to cook a main course but Chef Pichlmair did spoil our taste buds with scrumptious desserts in glasses. They were indeed ‘Lecker’! Schwarzwaelder Kirsch (page 347) – black forrest dessert and Exotischer Milchreis (page 350) – exotic milk rice. 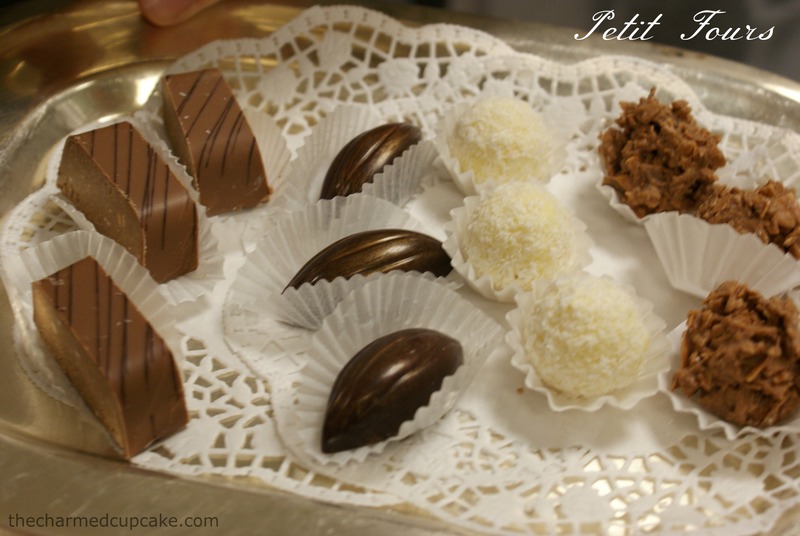 And to bring the Sacher Kochbuch presentation to a final end, we were served up some very quaint, delectable Pralinen or Petit Fours (page 343). What better way to present to us the latest Sacher Kochbuch than by letting us sample a few of the mouth-watering dishes conjured up by the Sacher-Chef himself, Chef Werner Pichlmair. It was my great honour along with my fellow food bloggers to get to experience and sample a taste of this latest edition of the Sacher Kochbuch first hand. And we didn’t walk away empty-handed. 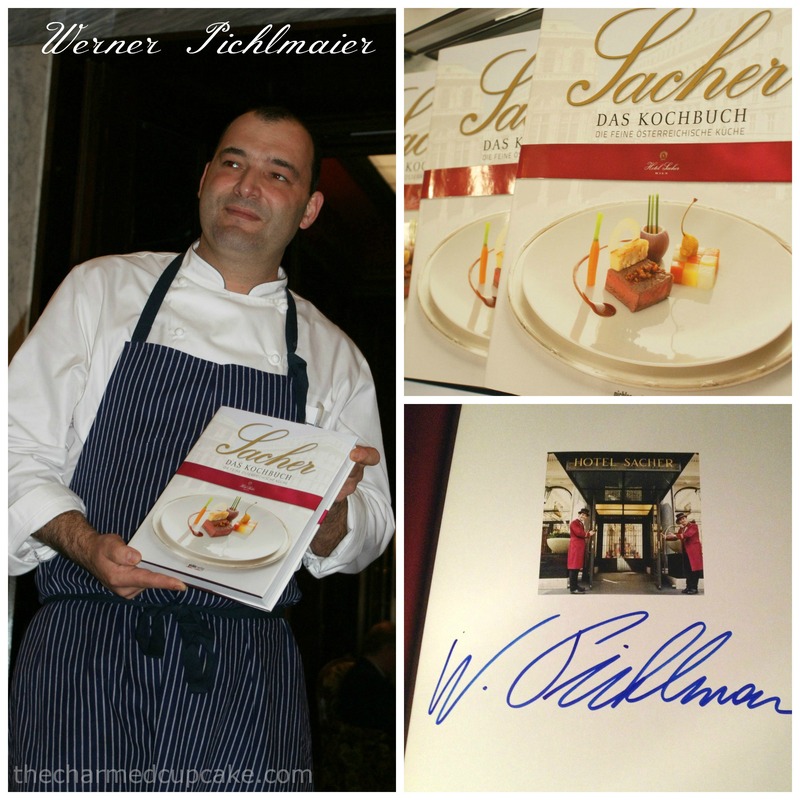 To all of our great and wonderful surprise we all received a signed copy of the Sacher Kochbuch by the renowned chef himself – WOW! I would like to thank the Hotel Sacher Vienna team for this lovely invitation and their magnificent hospitality. Coming from a hospitality background myself I know how much hard work and organisation went into making this presentation a success and for that I thank you! Also a huge thank you to Sacher-Chef Werner Pichlmair for his time and patience with us. Thank you to him for delighting us and his guests with his contemporary Austrian cuisine. With long-standing products, his proven cooking traditions, respect for ingredients and world-famous recipes he has combined simplicity, creativity and culinary vision. The New Sacher Kochbuch is without a doubt full of culinary delights, easily to understand recipes that can be made at home with simple materials. 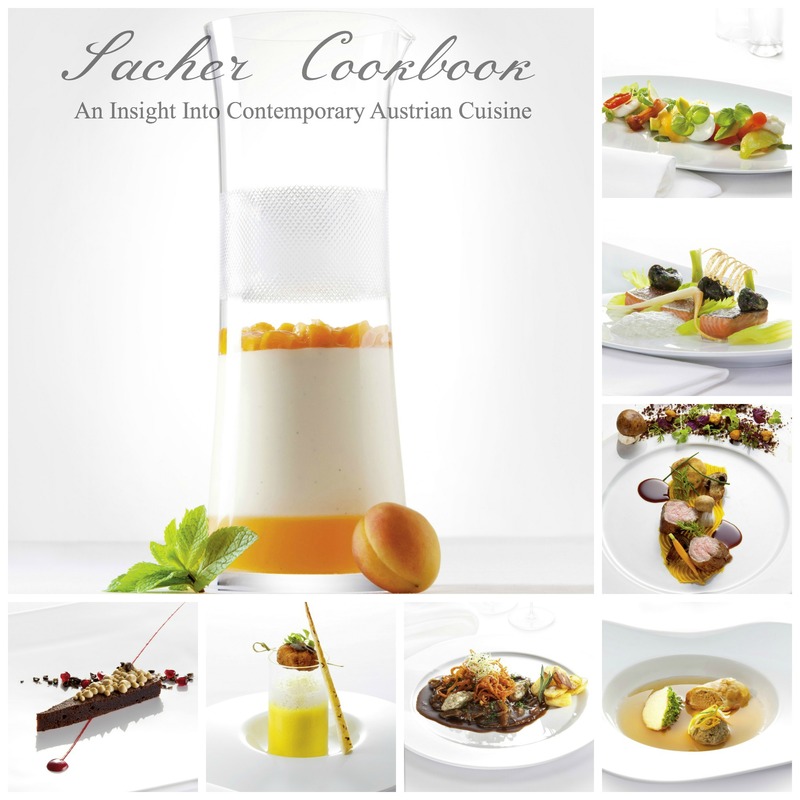 It is a milestone on the Austrian cookbook landscape and I can not wait to try the recipes. 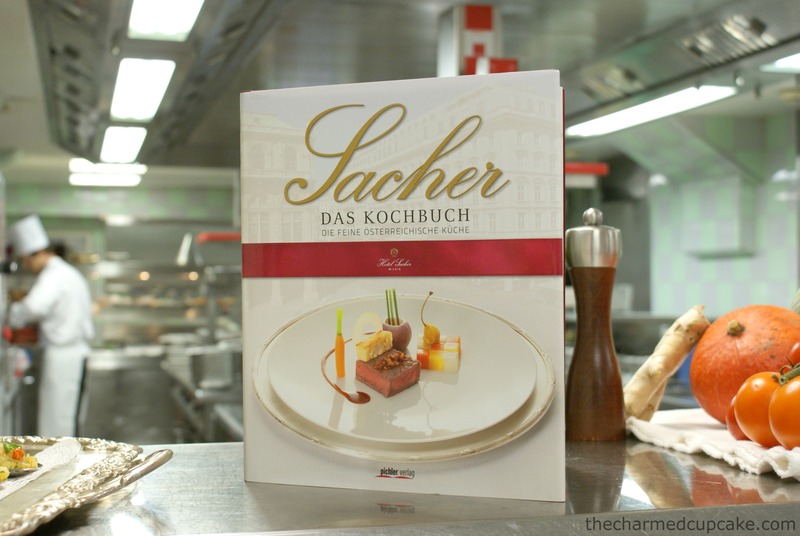 To my readers, I hope you enjoyed this quick insight into the new Sacher Kochbuch. I will now leave you with a few beautiful culinary photos by photographer Michael Rathmayer which you will also find in the magnificent 400 page Sacher Kochbuch with 380 recipes. The book is now available in bookstores but currently only in German. The English version will be released at a later stage. Super Zusammenfassung, war echt ein toller Tag!!! Ich hoffe es ist ok, wenn ich den Link zu deinem Artikel im Foodblogger-Artikel hinzufüge?! lg Ulli PS: Und es war auch sehr nett dich kennenzulernen!! Vielleicht auf ein baldiges Wiedersehen beim Blogger-Punsch?! 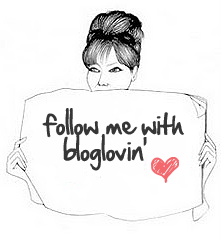 It’s a pity I’m all the way in Linz so I don’t get to meet up with all you wonderful bloggers as often as I’d like to. This was my first meeting so you’ll have to excuse me when I ask who organises Blogger-Punsch?